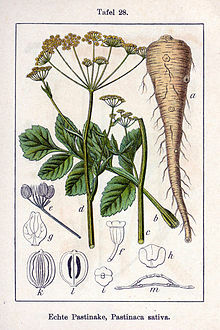 Dealbh le Johann Georg Sturm bho Deutschlands Flora in Abbildungen a sgriobh e.
Curran geal (Pastinaca sativa): seòrsa glasraich a tha mar curran buidhe, ach tha blas eadar-dhealaichte aige. Tha an curran geal beagan milis cuideachd. Air a tharraing à "https://gd.wikipedia.org/w/index.php?title=Curran_geal&oldid=470897"
Chaidh an duilleag seo a dheasachadh 11 dhen Dàmhair 2014 aig 03:58 turas mu dheireadh.